Karl here. 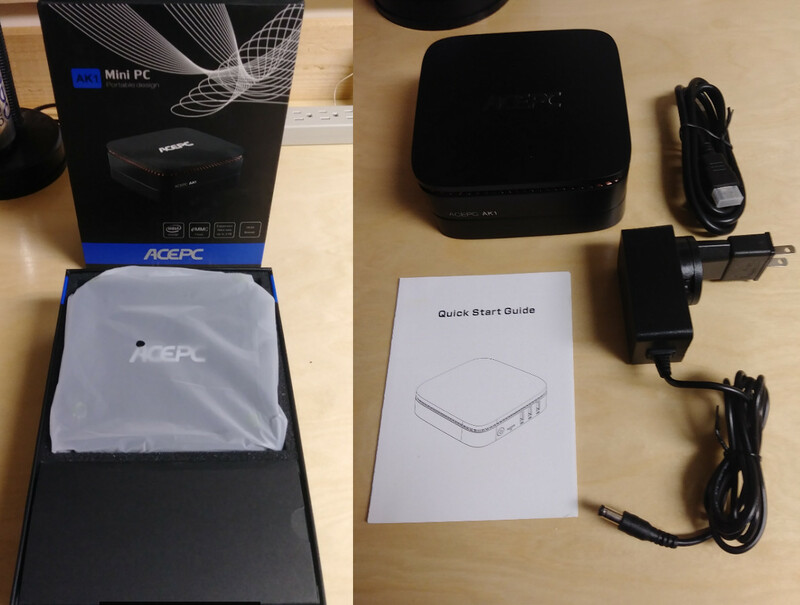 Today we are going to look at the ACEPC AK1 mini PC. Here are some of the specs pulled from ACEPC’s website. The feature that is most notable to me is the included 2.5” hard drive compartment. Some close-up photos to get a better look at the chips, and overall hardware design. 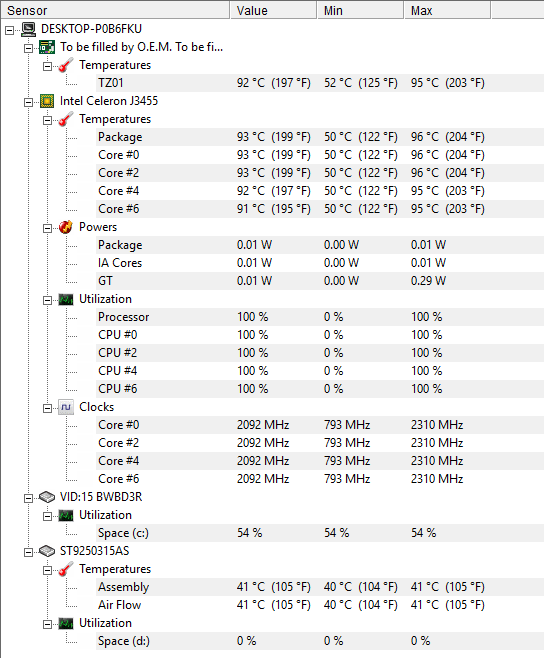 Cooling seems adequate. Below is a picture of Prime 95 after 5 minutes. 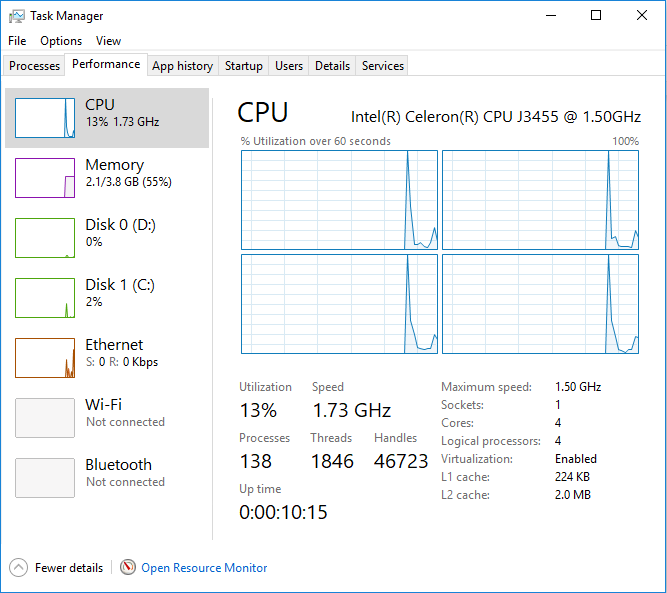 I am glad to see it staying at about 2 GHz considering the base frequency is 1.5 GHz. After stopping, it loses 30° Celsius immediately and after 30 seconds back to around 50° Celsius. 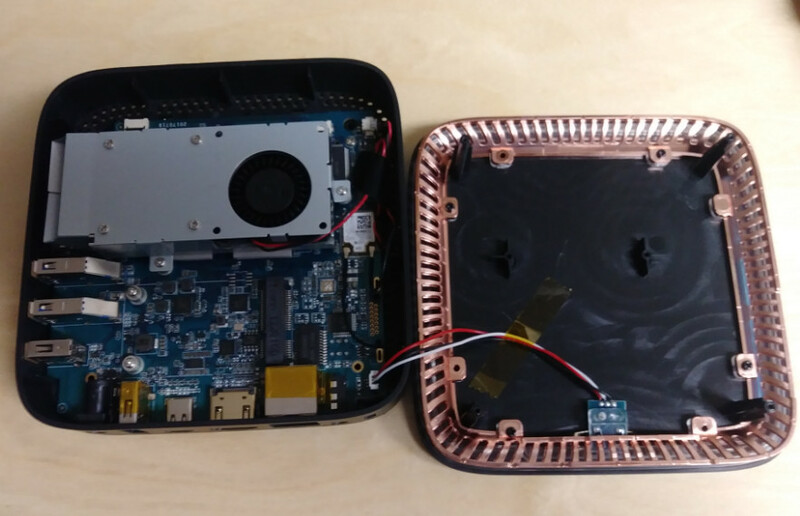 One of my goals for the second part of this review is to use it in the living room as a silent PC and mini server. I want to stream games from my new rig via Steam in Home Streaming and/or Nvidia GameStream. I want to also test it as a Plex server. Plex is testing out some hardware encoding on its beta software and I will be installing it on this box. I used Emby for a long time, but got to a point I had to reboot daily. Home automation server and Minecraft server should be a cakewalk. I have installed Steam and Moonlight chrome plugin, and tested them for a few minutes. Both work as expected but Steam is the clear winner at 25% CPU usage. It would be really great if I could both stream a game and live encode TV from my antenna. I think it won’t be a problem but need to test. My in-laws canceled pay TV a while back and they stream live TV from our antenna through the Plex app on Mi Box. They are even more rural than we are, and get no channels unless they erect an outside antenna. This is subjective but I do like the way it looks. Has enough IOs. I wrote this article on it and other than typing on Logitech K400(ugh), it was uneventful. 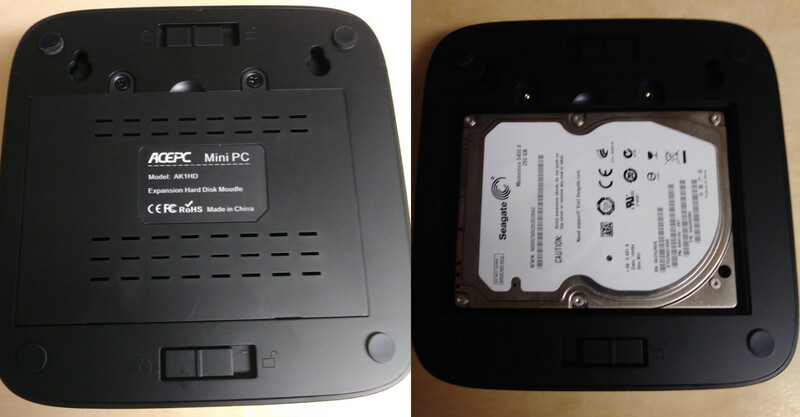 The expansion for a 2.5” hard drive is a great feature in my opinion. I just added a hard drive taken from a laptop. I have only tested out Ethernet at this point. I am in my lab and testing WiFi here is unfair to any device. If you would like to see any specific benchmark/test please let me know in the comments below. I would like to thank Gearbest for sending ACEPC AK1 for review. It is currently on sale for $149.99 [Update: coupon USBLOG9 drop the price further to $147]. The device is also sold on Amazon US for $199.99, and it can be found under other brands like Unistorm, WooYi, Findarling, etc.. on Aliexpress. Really like the small form factor here but I am concerned about the awful speeds of attached SATA drive, reported by many users. 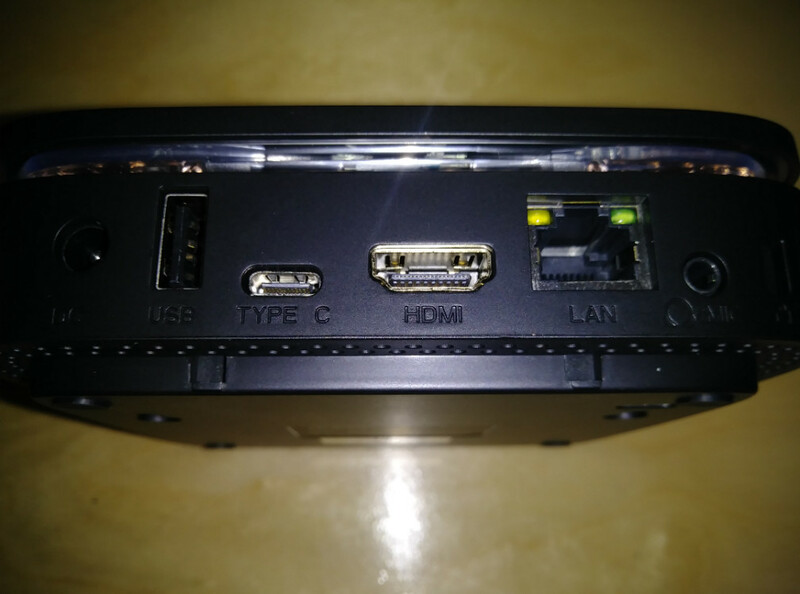 Other thing I would appreciate if you provide info from tests of the 1.4 HDMI maximum resolution and USB-C. Thanks in advance! Thank you for the questions i will address them in the next part. Would be grat to know, if you can use a ssd in msata as main boot device for windows? That would be much faster than the eMMC. @Karl Johnson has provided clearer photos. I’ve added them to the post. And I have an msata on the way to test with. Just a small 16gb from eBay to see if I can get Linux to boot. I purchased one of these but soon sent it back because it overheated. 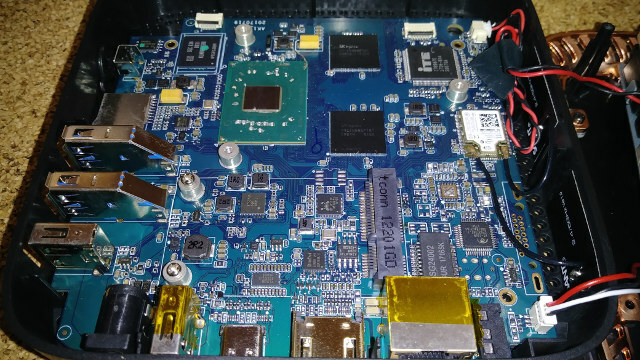 Gemini Lake is almost here now and with this one not even having a LSPCon to HDMI 2.0 option, as with the Vorke V1 Plus (sadly with it’s very noisy fan). then I think that many Apollo Lake devices will become obsolete very soon and will be heavily discounted to clear stocks. ACEPC themselves are also not a very responsive company. They never reply to emails and once had a discussion forum on their site that they took down when they began to receive a lot of negative comments and were also unable to confirm some functionality of their own product, so not a company inspires great confidence. How did you determine it overheated? I too would like to know if it could boot from the SATA hdd! some of the Chinese deals on Apollo Lake devices are amazing. I bought a Jumper EZ Book 3 Pro, 6GB RAM, 64GB Samsung eMMC, IPS fullHD display, 2 x USB3.. just £185 or $210. The cheapest I could find was $229. Where did you get it at $210? Initially from benchmark tests and from the way that the fan was cutting in with the most basic of tasks and then using a probe to determine the high temps and continual rebooting. The lack of any response to emails to the company about it told me a lot too. Hi. My computer does not recognize a hard drive Toshiba 2.5 Sata 1 Tb mod. MQ01ABD10. Can somebody help me? I had a similar problem in MeLE PCG35 Apo mini PC with the drive not showing in File Manager. Hello, and sorry for my english, i don’t speak very well. So , i bought an acepc ak1. Do you where i can find drivers, notice or explanation. How can i access to the bios ? How can i save the partition if iwant to re install win10? Can i upgrade to win10 pro. 1. 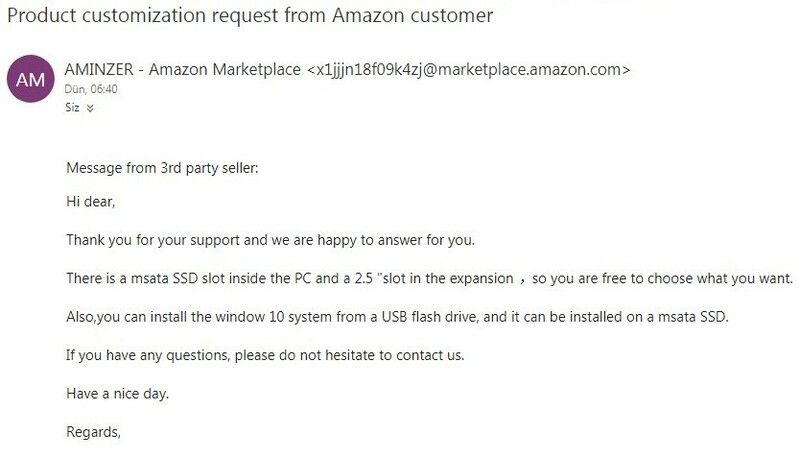 I found the drivers download over at Amazon Forums: https://www.amazon.com/ask/questions/Tx20UKN5GXPDQM4/?source=allQuestionsPage the first and only answer (from seller) has a link. 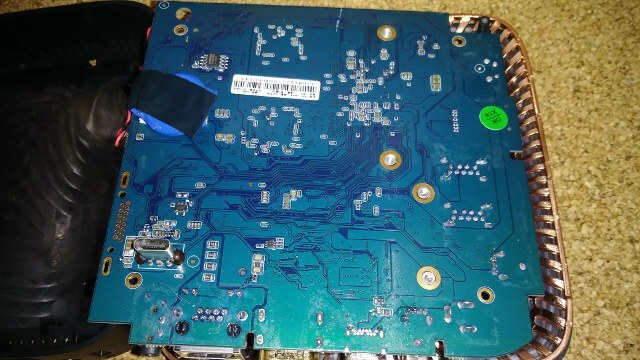 Could you give some info about sata slot? I want to add SSD. Can I boot it from Sata slot? Yes, you can boot from the internal mSATA slot but can not boot from external drive-bay. But in my case after installing mSATA the cpu fan turned on more often. I think it’s because many mSATAs are getting rather hot. It is my mistake. I mean How can I use SATA III slot 🙂 Can I boot from it and install windows? Thank you so much for your answer. Although you can install a ssd to the SATA III slot and store data on it, I think you wont be able to install windows to and boot from it. At least that’s how it was in my case. And posts in other forums tell that, too. 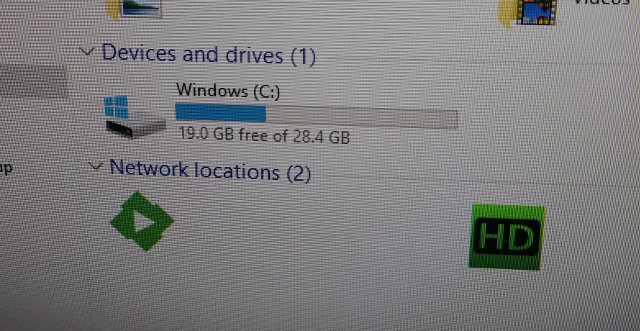 Upsss 🙁 I found install windows 10 to USB HDD or fast flash disk. Maybe I can boot it usb 3.0 gate. I think it will be better than eMMC. Thank you so much again. I hope you are having a great day. I just had mine do so. Installed an Intel SSD, installed Windows 10 from scratch and now it boots from there. No sir, I did it on mine. First you need to enter into BIOS and change the boot sequence, boot from a USB drive preloaded with Windows 10 installer, then you just need to choose your SSD as target installation. Next the Windows Boot Manager will ask you where do you want to boot from. Works like a charm. – What I did was extracting the drivers from the included Windows installation. 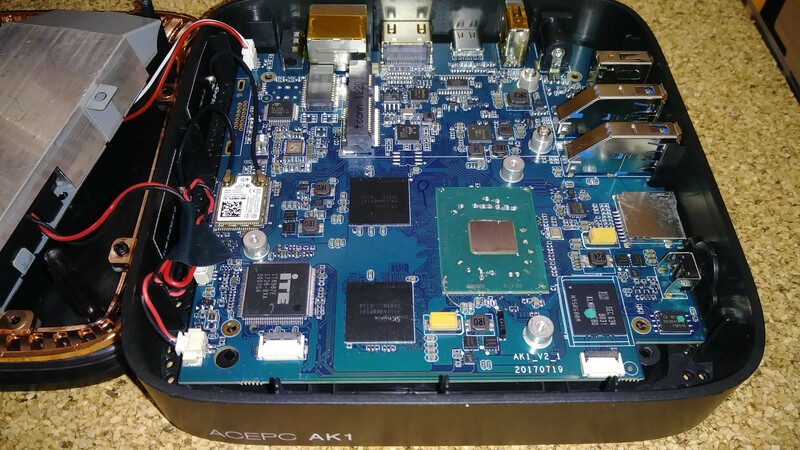 – To enter the BIOS: ESC or DEL during boot up process. If no avail you can get Windows do so for you. – Rather than save partition I would recommend a fresh Windows installation from scracth. – It does support Win10 Pro. Has anyone connected the HDMI from this thing to an audio receiver to see if it supports Netflix 5.1 audio format? Thanks anyway for this information! and a M.2 here …..
Hi guys. Please someone helps me. I bought a ACEPC AK1. But It is not delivery to me yet. I have some questions. 1) Can I add msata or m.2 sata? Which one should I choose? 2) Can I boot from bootable usb flash drive for install windows 10? 3) Can I install Windows 10 to msata or m.2sata? Please help me. Sorry for my English. If you answer my the questions, I am grateful to you. Also I asked my question and they are gived answer. I take screenshot from my email and share with you. My english is bad. I read the article and I understand that I can install windows 10 to msata. And than My windows 10 will be activated When I wiped 32GB eMMC. Is it true? Basically, you need to dump the data from the eMMC to the M.2 SSD, fix and resize the SSD, and it should work. But there’s no guarantee it will always work because that’s against the discounted Windows license terms. I apologise. I never got notified of these comments. I was able to boot from both msata and external hard drive with only windows. But I believe the existing windows installation needs to stay. I took a double driver backup of drivers and made bootable usb windows installation and did an install from it.